From the Source: Creature Comforts Brewing Co.
At the time, it ruffled a few feathers in a Georgia beer scene that was just beginning to flourish. But then again, maybe they needed ruffling. Longtime Peach State beer advocates wondered who this brash young man was, and wondered if his brewing talent could keep up with his mouth. Some of the naysayers even quietly hoped it would. Time has a funny way of correcting moments like this, but in the case of Stein’s new brewery, which opened in Athens about a year and a half ago, the prophecy came true, in a way. Creature Comforts is making some of the most raved about beers in Georgia. Stein started homebrewing in 2005. About five years in, his beers were getting better, and his job at the legendary Brick Store Pub afforded him the opportunity to sample them out, soliciting valuable feedback. So in 2010 he decided to give his brews a name. Creature Comforts beers started mysteriously showing up at beer dinners, bottle shares, and events run by people in the know. did a short apprenticeship with Scotland’s BrewDog, ending up back in Georgia at Twain’s afterward. When Top Chef alum, Athens resident, and Georgia res- taurateur (Five & Ten, Empire State South, The Florence) Hugh Acheson connected Stein with a group of investors who wanted to open a brewery in Athens’ downtown Snow Tire building, he jumped at the opportunity. With Stein and Beauchamp as co-owners and -brewmasters (Stein is now director of innovation and procurement), they brought on a talented homebrewer and photographer, Blake Tyers. 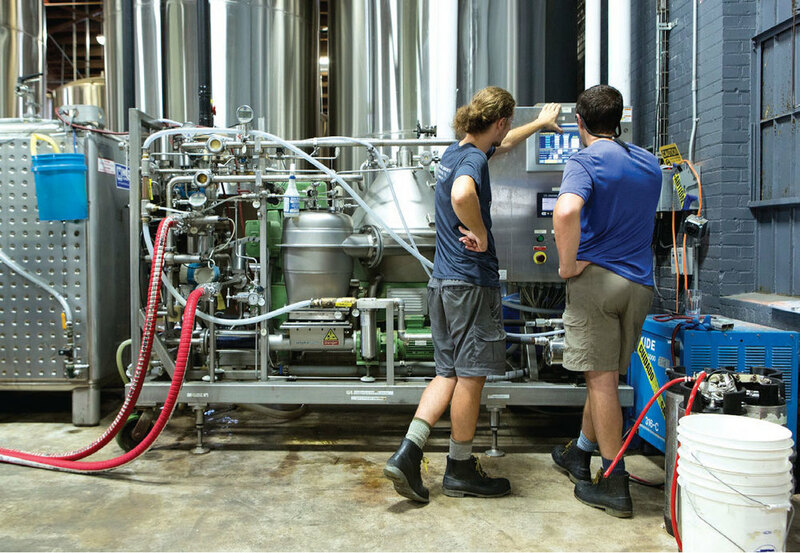 He started in the cellar, filled in on brew shifts when needed, and did all of the brewery’s photography and much of its marketing and social media. He has since been promoted to head brewer. Next, they needed a business brain. Chris Herron had worked his way up from a Miller Brewing Company intern to nine and a half years at Diageo where he’d held roles in distributor management, pricing strategies, and commercial finance. He’d also been writing a brewery business plan of his own, so he happily moved his pregnant wife and two children from Connecticut back to his home state of Georgia to serve as Creature Comforts CEO. Creature Comforts brewed around 2,000 barrels in the eight months it was open in 2014, and will likely top 10,000 barrels in 2015. Just before hitting the half-year mark, it brought home a bronze medal in the American Style Brett Beer category at the Great American Beer Festival. Its other barrel-aged selections have been the talk of recent Georgia beer festivals and competitions while its dialed-in core lineup—a Pilsner, an Amber, an IPA and a Berliner Weisse—are not easy to find. A big, dry, double IPA brewed with Simcoe, Amarillo, Citra and Columbus hops that’s as exciting as the 1974 Frank Zappa song from which it takes its name. Taking its name from Greek goddess of wisdom, this crushable German-style wheat beer pairs a pillowy soft mouthfeel with a subtly tart, lactic acid bite. Hoping to change how Georgians feel about Amber Ales, Creature used French oak and rye to help round out this beer, adding notes of spice and vanilla. The runaway hit so far, Tropicália features loads of citrus aroma and fruit flavor, eschewing the hop-bomb bitterness that can often come with the style. a bit of Motueka make this year-round Pilsner a dry, refreshing beer with notes of pineapple and black pepper. This cold-weather seasonal is built on a profoundly smooth blend of toasted coconut, vanilla beans, cacao nibs and coffee that pairs well with winter’s first snow. That iconic building feels more like one of Acheson’s hip restaurants than a brewery. Reclaimed wood lines the walls around two rows of taps on either side of a giant room filled with tables. Copper light fixtures hang over the bar, and a garage door opens onto Hancock Avenue, letting in the sights and sounds of the University of Georgia. The Athens farmers market is held there weekly. They’re actively involved in the Guild, too, working to change Georgia’s restrictive beer legislation. Tyers says he gets “extremely hopeful” when he visits states that have better beer laws and more robust beer scenes as a result. In a couple of years, the brewery may make an even bigger statement if Georgia’s laws don’t improve. Beauchamp says Creature will max out its Athens space by 2017. The partners have already begun the site selection process for their next location, which will likely be a large production facility, freeing up the original space for more experimentation, one-offs, and barrel aging. Beauchamp thinks the state stands to lose out on a lot of money if things don’t change.